January 2, 2019 by Shikha Mane, M.D. Atopic dermatitis, otherwise known as eczema, is a non-contagious chronic inflammatory skin condition that typically begins in infancy or early childhood, and presents before the age of 5 in more than 90% of cases. Eczema symptoms and flare-ups tend to stop in half of the children during adolescence. However, it can persist into adulthood for some individuals. And for others, it may begin in adulthood. It is very rare to develop eczema after the age 60 and if this occurs, other diseases should be considered. The most common symptoms include dry itchy skin, red/brownish patches on the skin, and cracks and oozing of the skin. It is characterized by the “itch-scratch cycle”. The tendency is to scratch the skin when it is itchy. As this repeats, the skin barrier can become compromised, allowing irritants and allergens to cause further inflammation, perpetuating the disease. Over time, this may cause thickening of the skin. The distribution of the lesions changes with age. For children less than 2 years-old, the rash typically affects the face and the extensor surfaces of the elbows and knees (outer aspects). In older children, the flexure surfaces of the elbows and knees (inner aspect/creases) and the feet are affected. In adolescence and adulthood, the rashes become more variable and widespread with a predominance of the hands. For many individuals, atopic dermatitis can negatively affect their quality of life. It is an important cause of school absenteeism and occupational disability. Sleep disruption is a major problem for patients and their families. It is unclear exactly what causes atopic dermatitis; however, it is thought to be a combination of genetic and environmental factors. Research has shown that some people with eczema have a mutation of a gene responsible for making a protein called filaggrin. This particular protein is important for maintaining a healthy protective skin barrier. Without this protein, the skin loses moisturize causing dry, itchy, and infection-prone skin. We also know that children born into families that have a history of atopic dermatitis or other allergic diseases, such as asthma or allergic rhinitis, are more likely to develop atopic dermatitis, showing that atopic dermatitis may have a hereditary component. In addition, atopic dermatitis may be considered to be the beginning part of the “atopic march.” This term refers to the natural progression of allergic disease that begins in early life, starting with atopic dermatitis, followed by food allergy, allergic rhinitis and then asthma. Studies show that up to 80 percent of children with atopic dermatitis develop asthma and/or allergic rhinitis later in childhood. Environmental triggers definitely play a role; however, eczema affects everyone differently – what may trigger one person’s eczema may not be the same as another’s. Although the majority of eczema is not related to foods, research has shown that food allergies may trigger eczema symptoms in about 30% of children, under the age of 5, with moderate to severe eczema. The most common food allergies associated with atopic dermatitis include milk, egg, soy, wheat, peanut, nuts and seafood. 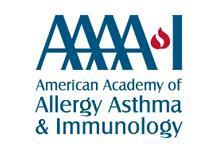 Board-certified allergists are specially trained to diagnose and treat atopic dermatitis. Diagnosis typically involves a detailed history and thorough examination of the skin. Allergy skin prick testing may be helpful in identifying certain triggers, such as indoor or outdoor allergens. Food allergy testing is recommended for children with moderate to severe eczema and also if there has been a history of a reaction with a particular food. Laboratory testing is seldom needed, but may help rule-out other conditions. 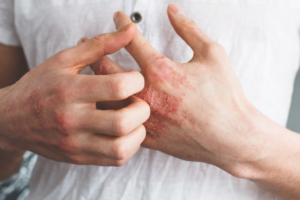 If underlying contact sensitivity or contact dermatitis is suspected, patch testing can help identify certain chemicals exacerbating the underlying eczema. Atopic dermatitis is a chronic condition sometimes requiring multiple treatment strategies. Dry and itchy skin will lead to scratching which can lead to further skin inflammation and eczema flare-ups. Thus, the key to controlling the symptoms of eczema begins with skin hydration, moisturization and routine skin care. It is recommended to bathe in warm water for about 5-10 minutes with a gentle soap, such as Dove or Cetaphil. Immediately afterwards, pat dry the skin and apply a moisturizer cream to the damp skin. Emollients, such as petrolatum, can help seal in the moisture. This can be done several times a day for dry skin. There are many over-the-counter products and some prescription emollients that can be helpful. Additional measures that can help prevent eczema flare-ups include keeping nails short and smooth, wearing cotton loose-fitting clothing, and using detergents that are fragrance and dye-free. Anti-histamines may be prescribed to help control skin itching. For active lesions, topical corticosteroid creams or ointments may be prescribed to help control the inflammation. Topical calcineurin inhibitors, such as Protopic and Elidel, and topical prostaglandin inhibitors, such as Eucrisa, are non-steroidal prescription medications that may help control the symptoms of eczema by blocking certain cells of the immune system. For skin infections or severe exacerbations, topical or oral antibiotics and steroids may be prescribed. Allergen immunotherapy or allergy shots/drops are helpful in reducing atopic dermatitis symptoms as well as reducing topical steroids required to control symptoms. In 2017, the FDA approved a biologic medication called dupilumab (Dupixent) that treats moderate to severe eczema in patients 18 years of age and older. It works by blocking interleukin-4 and interleukin-13 which are proteins of the immune system linked to atopic dermatitis and flare-ups in certain individuals. Dupixent is an injection given under the skin (subcutaneous) twice per month. The medication may be prescribed for those whose eczema cannot be controlled well by other therapies. Eczema can affect everyone differently. For some, symptoms may be mild and manageable with simple measures. But for others, it can be more pronounced with frequent flare-ups and could negatively affect their life. It can be a frustrating problem not only for the patient but also for family members. Our board-certified allergists at North Texas Allergy and Asthma center are specially trained to properly diagnose, identify triggers, and treat underlying atopic dermatitis in infants, children and adults. If you or your family member suffers from eczema, contact our office for an appointment so we can help manage your symptoms and make you feel better.